Pura Sakenan Temple: one of the holiest temple in Bali. The Shark Island conservation project, which nurtures white-tip reef sharks. Citra Taman Penyu, where green sea turtles are bred and hatchlings nursed. The Serangan Beach: white sands, shallow and clear waters, and good surfing for beginners. Take a taxi, bemo, or ojek. How popular is Turtle Beach? People normally club together Elephant Cave and Bamboo Bar And Grill while planning their visit to Turtle Beach. Beach is no longer open. They are doing a hotel development there. Used to be amazing, but now you can only get there by boat. And only for surfing, Warungs are closed and no more swimming. Yet another great beach to visit on the Island of Bali. Second stop for the day and not at all a disappointment. Although be prepared for a very bumpy ride for a couple of kilometers in from the main paved road. The water is clear and great temperature for swimming, even on a cloudy day. You also have a great view of the planes landing at the airport, passing right over the beach. A great spot for plane spotting if I had a better camera and tripod. Big paddle out past the reef into the line-up. Sneaker sets known to roll through. Big spread rights & lefts. Can handle size. Strong currents, not for the weak. Bumpy dirt road makes for a good off-road adventure to get to the beach. 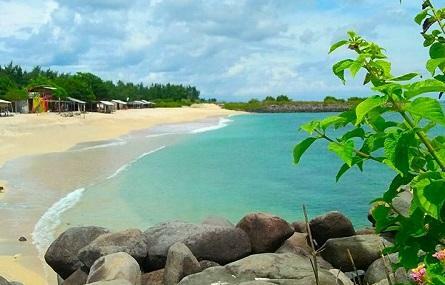 Beautiful beach off from the main hustle and bustle of southern Bali located on turtle island. Great waves for people of all skill levels. Cheap food and drinks available for purchase at many of the beach front warungs.. Eat fruit salads to chicken noodles with your toes in the sand then enjoy a fresh coconut on a free beach sun lounger. Indonesian messages are available at many of the warungs as well. Good for families with kids.